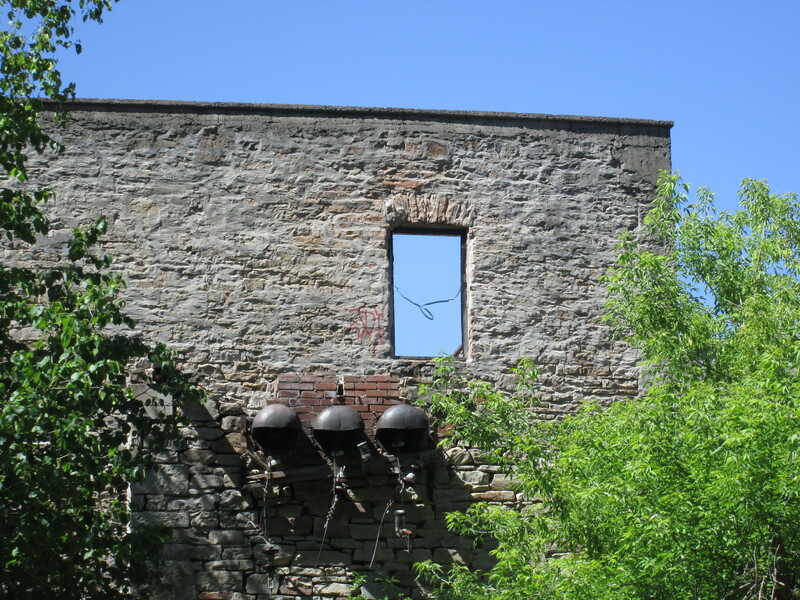 The Barber Paper Mill ruins are comprised of several Victorian era industrial buildings that are slowly decaying in Georgetown. It was sunny and 11 degrees with enough breeze to blow the bugs away. The next stop up the Credit River north of Norval is the Barber Dynamo. We decided to access it from the north side which meant parking on Maple Ave. in Georgetown right beside the ruins of the Barber Paper Mills. An exploration of the Dynamo pretty much requires a look at the paper mill that led to it’s creation. The Barber family came to Upper Canada in 1822 and settled in the Niagara Peninsula. In 1825 they helped James Crooks win a $500 bounty from the government for establishing the first paper mill in the colony. In 1837 they decided to go into business for themselves and moved to Hungry Hollow (now Georgetown) and bought the woolen mill that belonged to George Kennedy who, in 1820, was the founding father of Georgetown. As the business expanded they started a second woolen mill just south of Streetsville in what would be known as Barbertown. 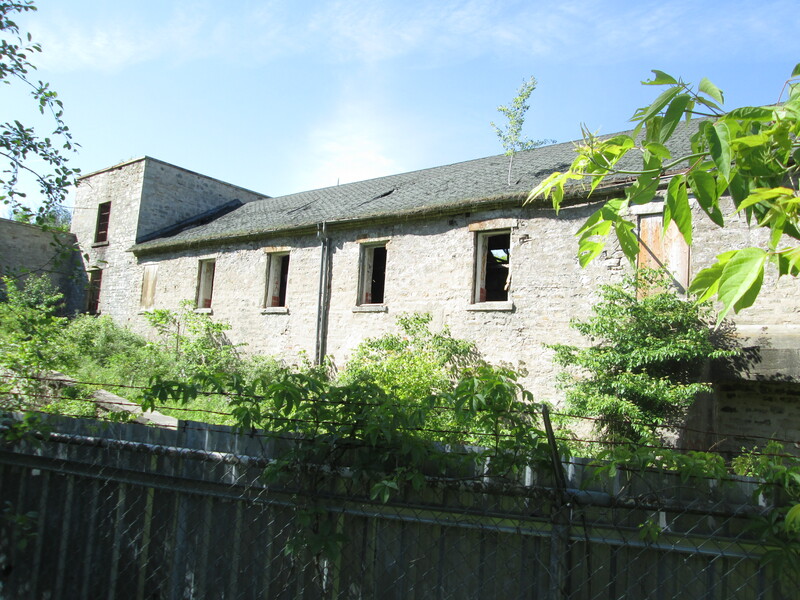 By 1852 their woolen industry outgrew both buildings and a new larger one was built in Streetsville. It was at this time that the new paper rolling building was completed. This allowed the mill to expand from a 91 cm cylinder to a 122 cm paper rolling machine. Wallpaper was added to their list of products and by 1862 it is said that they had the largest wallpaper factory in North America. Beside the Paper Mill building stood the machine and maintenance shop. It has lost all of it’s roof and can be seen in the foreground of this picture. The archive photo below from 1910 shows the paper mills as they looked in their prime. The paper machine building and maintenance shops can be seen near the bridge. The little brown building behind the bridge was the offices, now demolished. A horse barn and wood storage lot stand where Maple Avenue now runs. The two smoke stacks were on boiler and digester rooms where the paper pulp was made. 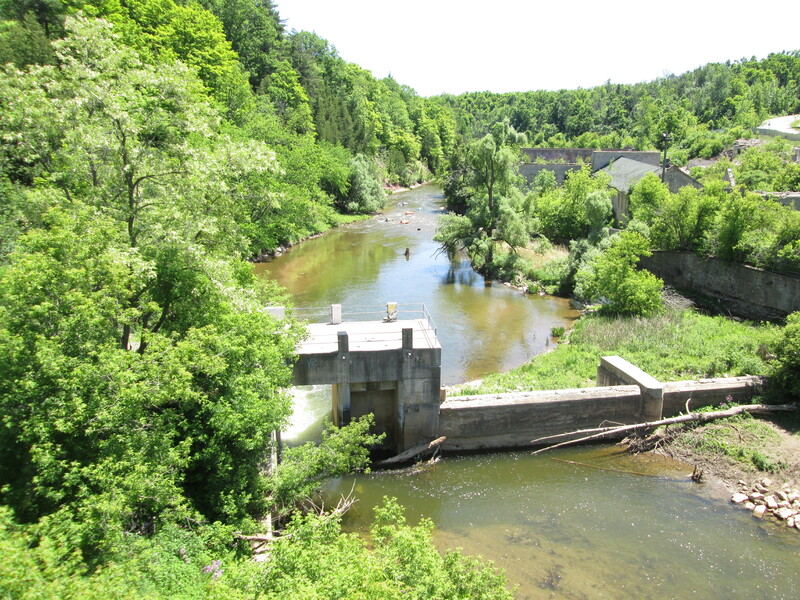 The dam across the Credit River for the paper mill was replaced with the current concrete one some time between the picture above from 1910 and a subsequent one from 1930. This picture is taken from the modern bridge which was built in 1973. In 1869 John Roaf Barber took over the mill operation at the age of 30. By 1886 the business was growing and the mill ran into an old problem. Insufficient water power to keep the machines running. At the mill site the head of water (height which it could be made to drop to do work) was only 4.5 meters. A spot was found about 3 km downstream where a head of 6.6 meters could be obtained. The solution was to build the Barber dynamo which will be explored in a companion post. 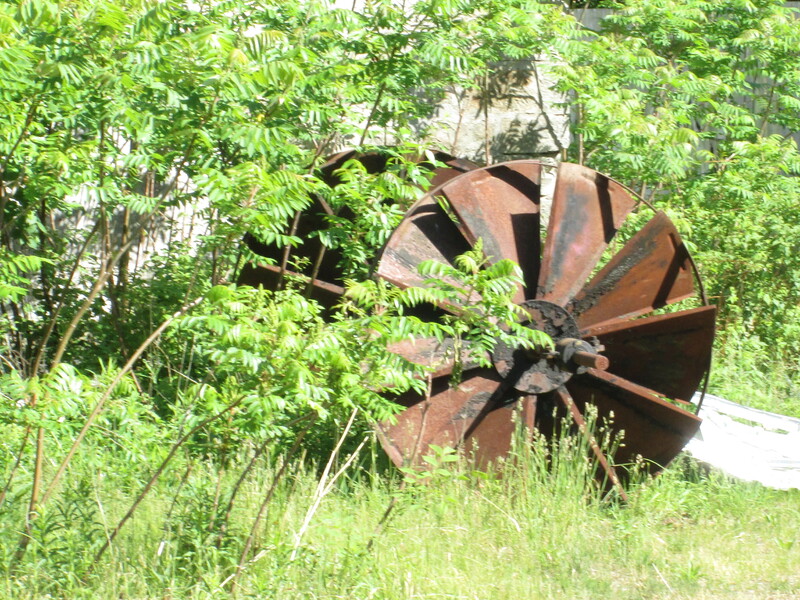 The mill was using two sets of turbines like the one pictured below. It appears that there may be at least 3 of these sets of turbines in the grass behind the sorting building which means the old ones from the dynamo may have been brought here as well. When the dynamo was brought into service in 1888 it made the paper mill the first industry in North America to generate and transmit electricity to operate it’s machines. This is the river view of the paper machine building. Paper had been made out of cotton and linen rags until 1869 when a pulp mill was added so that paper could be made from oat, wheat and rye straw. By 1879 wood pulp was replacing straw and John Roaf Barber was on the leading edge of the new process. The building below produced some of the countries finest wood based papers and ironically today there is a small tree growing on the roof above the first window. The power connection station on the river side of the building is a later addition as is testified to by the red bricks inset into the field stone construction of the rest of the building. There were originally two lines running from the dynamo to the mill. One was used for lighting and one to power the machines. 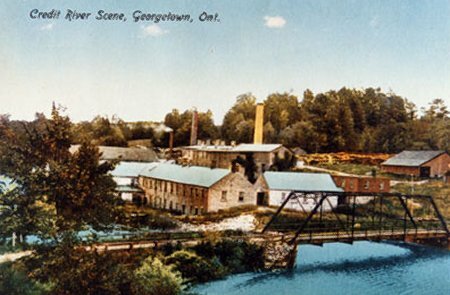 After 1913 the mill was converted to Ontario Hydro. This shot is taken from Maple Avenue and shows the south end of the property. The incoming sorting and storage building is in the rear while the foundations for the incinerator building or the shipping building can be seen in the foreground. We crossed the bridge to a blue marked side trail that is part of the Bruce Trail. Forget me nots grow along the north side of the Credit. 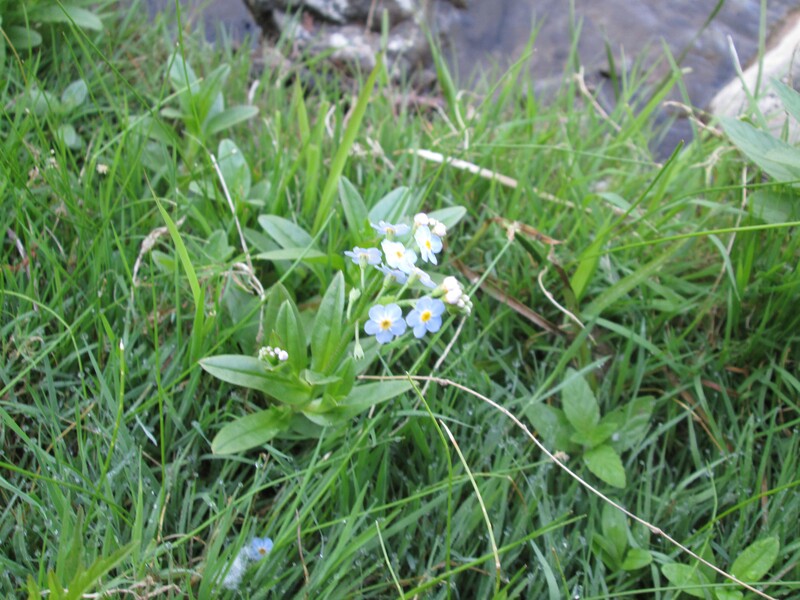 Legend has it that when God was naming the plants, this little one called out “forget me not” and God chose that for it’s name. Prior to joining Canada in 1949 the Dominion of Newfoundland used the forget me not flower for their Remembrance Day flower. The poppy has since been adopted but some still prefer the traditional blue flower instead. Normally born between late May and early July white tail deer fawns weight 4 to 8 pounds at birth. 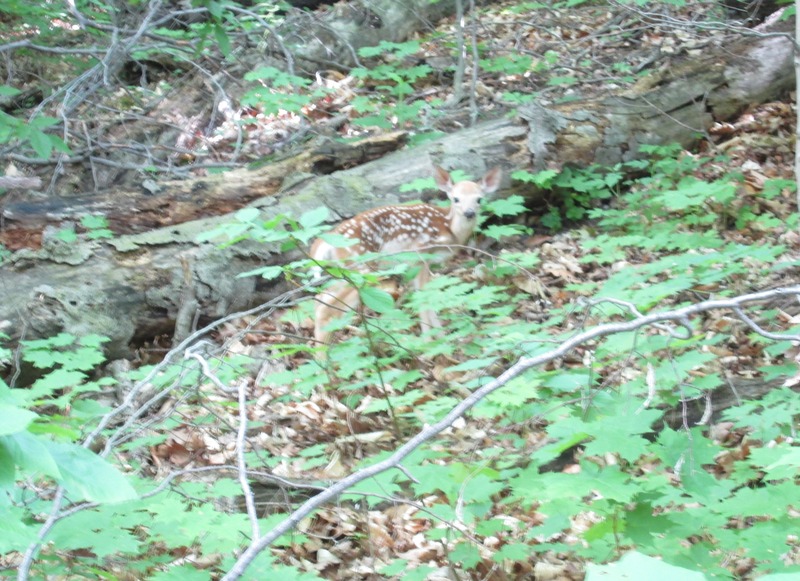 Fawns are supposed to hide for the first week while their mother forages. After this they will be with the mother until weaned in the fall. They will lose their white spots within the first year but they help camouflage them when they’re infants. This little one is barely taller than the log it stands in front of and at first I thought it was a dog. The paper mill was sold by the Barbers to Provincial Papers in 1913 who operated it until it closed in Nov. 1948. Various tenants occupied the buildings until the mid-1970’s when it was closed and left to rot. As for the fate of paper mill ruins? 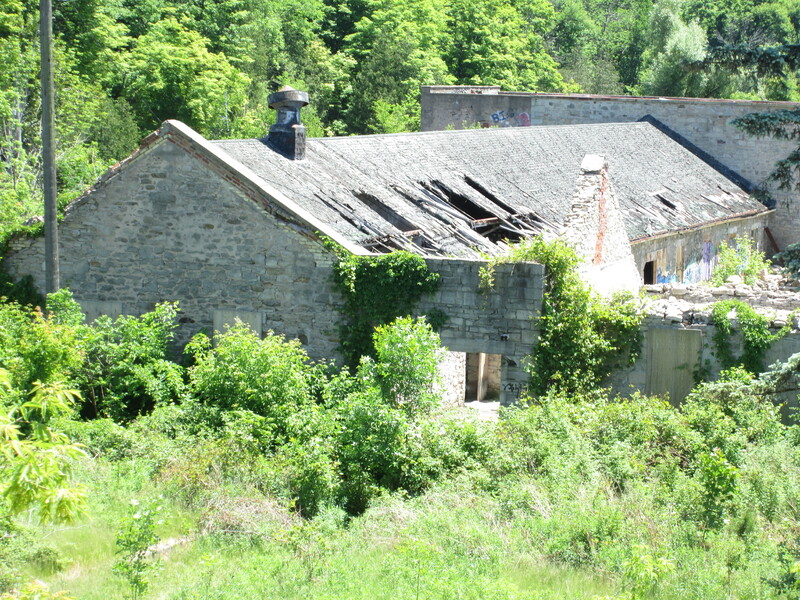 That remains undetermined but in 2008 the site was named as a cultural heritage property. 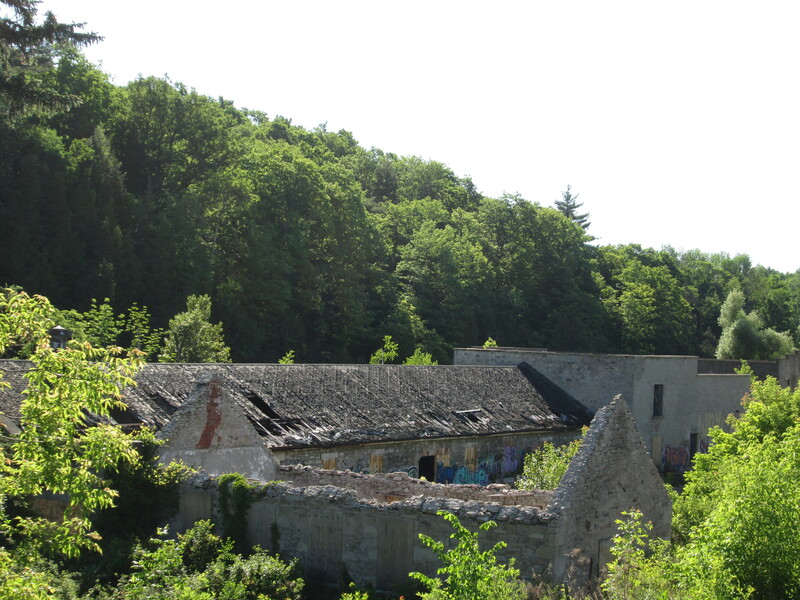 In 2015 it made Heritage Canada’s top 10 list of most endangered heritage sites. The current owners proposed a 14 story condo with much of the remaining heritage buildings retained. Problems with clean-up of soil contaminated by years of heavy industry have left the project on hold and the property is on the market again for a cool 5 million dollars. Leaving it behind we continued along the river toward the site of the Barber Dynamo. 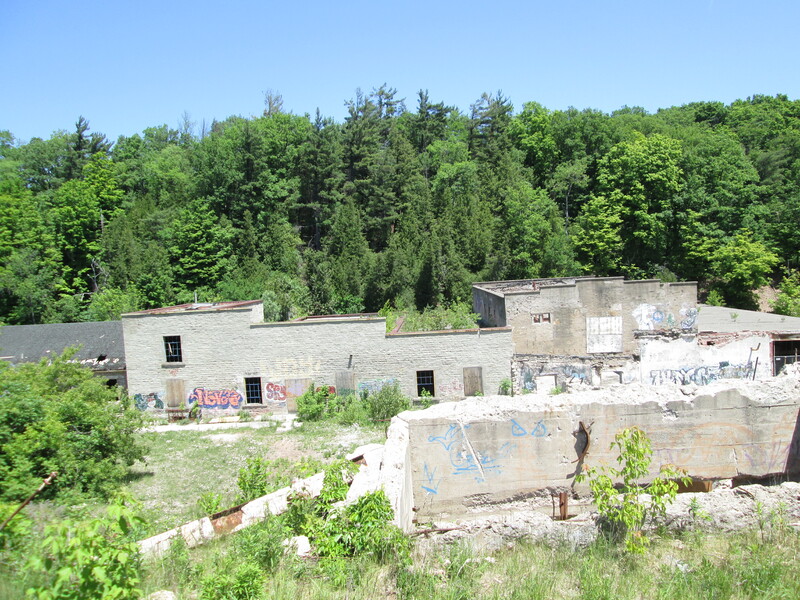 This entry was posted in Credit River and tagged Barber Dynamo, Barber Paper Mill, Provincial Papers, Turbine on June 9, 2015 by hikingthegta. Love your blog. I learn so much “little known” history from your hikes. It’s such a shame that we don’t preserve our history like some other nations. I worked at this site 1973 – 1976 when it was Deltacradt Furniture. Used to enjoy exploring the hidden caverns and chambers below the buildings leading to the Credit. Had heard it was a munitions manufacturer or. storage during WW2. enjoyed the history lesson although I believe the road is River Drive, not Maple Ave. I used to live nearby from 1954 – 1962 and played along these river banks often. River Drive and Maple Road intersect beside the paper mills.